It’s hard to believe that only one week ago, I was between homes. My parents and I flew red eye. As we made our way to the airport, I kept my face turned towards the car window. In the struggle to pack every suitcase into the trunk and leave nothing behind, I’d forgotten to take one final glimpse of my house, the garden, or my room. I felt uprooted and uneasy. I spent my last hour in Seattle trying to drink in the mountains, the water, the evergreens made silhouette-black by the twilight. By the time we boarded the airplane, the sun had set completely. I spent the flight between sips of ginger ale and bouts of restless sleep. But when I awoke five hours later to the pilot’s voice, crackly as crepe paper over the speaker, the aisle was flooded with light. Boston woke up that morning to a lavender sky and a molten orange sun, one of the most beautiful sunrises I’ve ever seen. I can’t pretend that my first days in Boston were without fault. It was uncomfortably hot and humid upon our arrival. On our first day we walked and walked and walked, until finally I nearly threw up in the sweltering subway station. And I was terrified. One of the first to move into the dorms, as soon as my parents left me alone to run some errands, I sat on my new bed and cried. It was just an accumulation of all the stresses, and you know I’ve never been good with change. But I unpacked, and everything found its place. I fitted the bed with my old sheets and blankets, so it felt familiar. By the time my roommate E- arrived, I was ready to meet her, and that night I slept easily in my new room. My parents left a couple days later. I met them at Neptune Oyster on their last night, where we had some really excellent calamari, smoked tuna, and raw oysters. I went through the motions of dinner like some weird dream, and fought tears when I hugged my mother and walked out. I slipped onto the T, rode home, and smiled at E- when I got back to my room. I’m sure that my school is the best school in Boston, maybe even the best school in America. (Half kidding.) The energy and passion here is honestly infectious. The people here are spirited, talented, and friendly to a fault. I’ve been to so many orientation events and activities that I can’t keep them all straight. I’ve met so many people that when I recognize a face, I don’t know whether it’s from an icebreaker game or the dining hall. And I love it. Even though it’s only been a few days, I’m already in love with this dorm building. I love the creaky elevators and the beautifully detailed ceilings. I love my roommate, who is funny and outgoing and open as a book. I love my 7th floor – where to even start? On the first night, when we played a 30 person game of musical mafia? Two nights ago, when we sat beneath the purple sky in the Boston Common? Maybe yesterday, when we went to the Quincy Market together and sang “Stand by Me” with one of the street performers. There’s P-, who is all too humble about his guitar and singing talents and wears funny shoes. There’s J-, who sounds EXACTLY like Michael Cera if you close your eyes. H-, who I shared an impromptu hug with in the elevator, S-, who looks like Mark Ruffalo, and C-, who has posters of Elvis around her bed. Is it possible that they already feel like family? I love the city of Boston. The way the squirrels in the Boston Common come right up to your feet. I love that everything is within walking distance, from the seedy grocery store in Chinatown to the fresh produce in Haymarket Square. My favorite place so far is the North End, where I like to walk alone through the winding cobblestone streets and carry a twine-wrapped box of cannoli. Although I’ve tried plenty of good food here, the one thing I haven’t done yet is bake. This dorm building doesn’t have a real kitchen, and anyway, I don’t have any ingredients or supplies at this moment. My schedule’s been so hectic that I haven’t craved it yet, but I will. I can’t picture my life without mornings at the kitchen counter. I don’t know yet what will happen, but I know I can make it work. These pretzels were the last thing I baked. It was the weekend before Boston, and my mother and I kneaded and twisted in the soft Seattle light I already miss. Neither of us had ever made pretzels before, and it was a bit of an experiment. We fumbled with the boiling water and had no idea how to form the shapes. 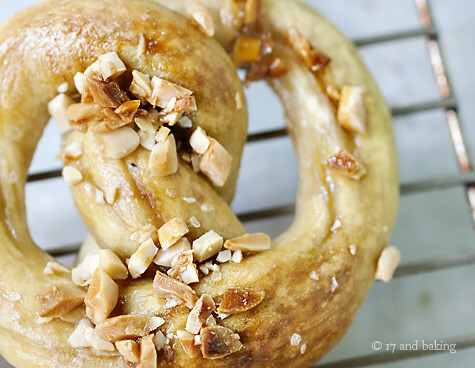 But when the pretzels finally came out of the oven, soft and golden-brown, we couldn’t wait to take the first bite. My life right now is anticipation. I can’t wait to bake again, and to start classes this week. I can’t wait for the leaves to turn crimson and gold in the October breeze. I can’t wait for snow in December, by which time I’ll probably be missing the August heat, and planning my first flight back to Seattle – a trip from one home to another. Add the warm water and 1 tablespoon sugar into the bowl of an electric mixer. Use the dough hook and stir to combine. Sprinkle the yeast on top and let it sit for 10 minutes, until the yeast is foamy. On low speed, mix in 1 cup flour until combined. Mix in the salt and four more cups of flour until combined, about 30 seconds, then beat on medium-low speed for 1 ½ minutes until the dough pulls away from the sides of the bowl. Knead in another ½ cup of flour for a minute on low speed. Depending on your dough, you can knead another ½ cup of flour. Knead for 30 seconds, until combined, then transfer to a floured board and knead 10 times until smooth. Coat the sides and bottom of a large bowl with oil. Transfer the pretzel dough to the bowl, turning it so that all sides of dough are coated with oil. Cover the bowl with a clean kitchen towel and let rise in a warm spot for an hour, or until the dough doubles in size. Preheat the oven to 450 degrees F. Line two to three baking sheets with parchment paper, or spray with cooking spray. Punch down the dough. 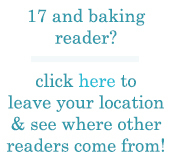 Knead it once or twice on a lightly floured surface, then divide into sixteen 2 ½ ounce pieces. Keep the pieces wrapped in plastic so they don’t dry out. 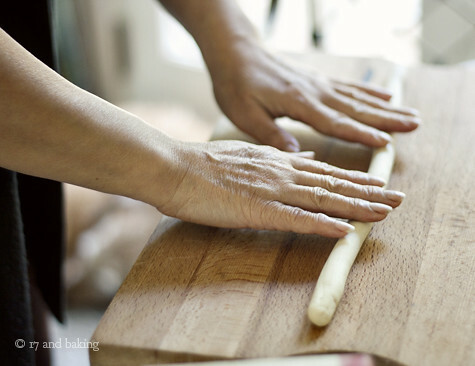 Roll each piece of dough into an 18 inch long strip and twist into a pretzel. Place on the prepared baking sheet and cover with a kitchen towel. Let the pretzels rest for 15 minutes. Fill a large, shallow pot with a couple inches of water and bring to a boil. Add the baking soda (it’ll foam up) and the last 2 tablespoons of sugar. 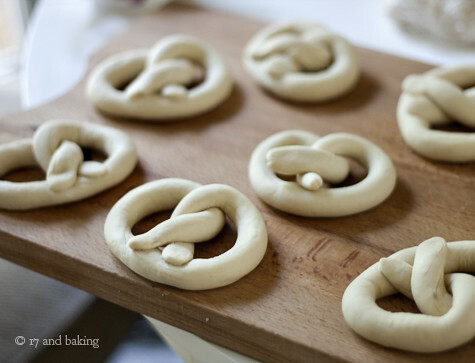 Reduce to a simmer and poach the pretzels – cook 3 to 4 at a time, a minute on each side. Transfer to the baking sheet with a slotted spoon. Beat the egg with a tablespoon of water and brush over the poached pretzels. You can sprinkle them with toppings – grated cheese, cinnamon sugar, salt. My favorite pretzels were almond. I mixed a few spoonfuls of brown sugar and water, and added chopped almonds. 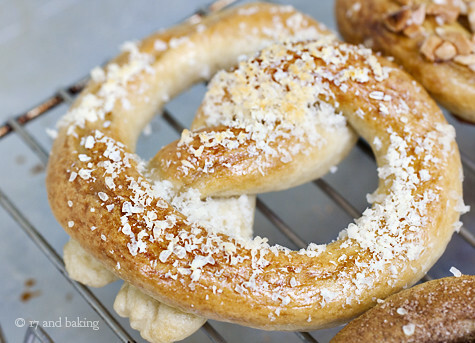 Bake the pretzels until golden brown, 12-15 minutes, and cool on wire racks. I thought they were best warm and fresh, but you can keep them uncovered for up to two days. Entry filed under: Breads, Breakfast/Brunch. Tags: almond, boston, bread, breakfast, cheese, cinnamon, Mom, nuts, savory, yeast. I also went to school in Boston. Your words take me back to a much simpler time. 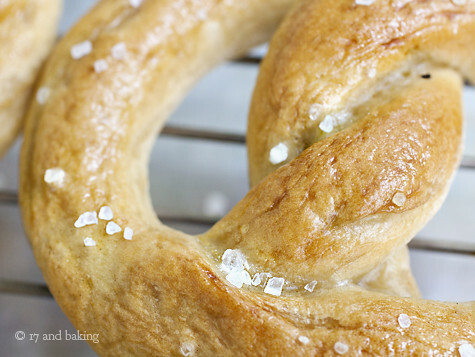 And these soft pretzels look divine!!! I’ve been waiting to try this recipe for a really long time and every time I go into the kitchen to bake it, I end up baking something else! But I’m moving out next week and I’ll have many evenings after work alone in my new apartment, so this is definitely on my list of this to bake. I was suggested this website by my cousin. I am not sure whether this post is written by him as no one else know such detailed about my difficulty. 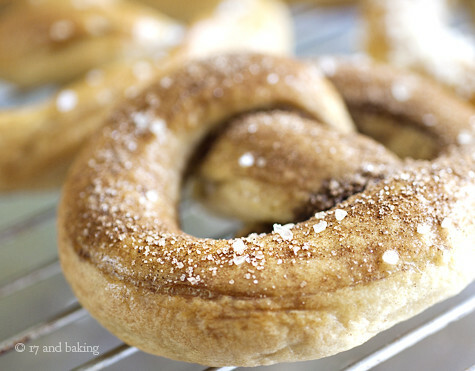 Thanks forr finally talkiing about >Soft Pretzels | 17 and Baking <Liked it!